There are lots of museums and bowling centers in Vienna. But what if you want to add motion, adrenalin and adventure to your indoor activities in Vienna? You’ll find what you need in today’s guide. We present seven ideas that will definitely prove worth your time. For your better orientation we have gathered all locations on the map at the end. Opening hours, public transport and prices can be found in the descriptions. At Schottentor you will find us with the next generation of Room Escape in Vienna – Crime Runners is the Live Action Adventure and indoor activity combining riddles and special effects. Choose one of our three missions and solve a murder case, search for proof against a corrupt politician or prevent an epidemic. If you want to spend your evenings more calmly, check out our blog posts about Pub Quiz Bars in Vienna or extraordinary Bars in Vienna. More ideas for spare time activities can be found here in our Vienna Tourist Guide. Who hasn’t dreamed about leaving the ground and flying through the air like Superman? In Vienna you can experience this feeling by visiting Windobona Skydiving. Indoor skydiving means flying through a wind tunnel, dreaming and being awake at the same time. You experience a simulation of a 4000 meter free fall and wind speed of up to 280 km/h, all in a safe indoor environment in a wind tunnel made of glass. Which means that you can try the adventure independent of weather conditions. Adrenalin and excitement are guaranteed. Indoor skydiving can also be tried by kids. Windobona not only offers you the chance to fly but also to book a training where you learn to safely move along the wind tunnel. Of course, if you’re flying for the first time you’ll get an introduction by a trainer. The experience is not too convenient, since two minutes in the tunnel cost you 49€. However it is easy to save money. You can share the flying time with your friends and you can fly together through the wind tunnel. The location opens Monday to Thursday from 2pm to 10pm, Friday from 10am to 10pm and on weekends from 9am to 10 pm. 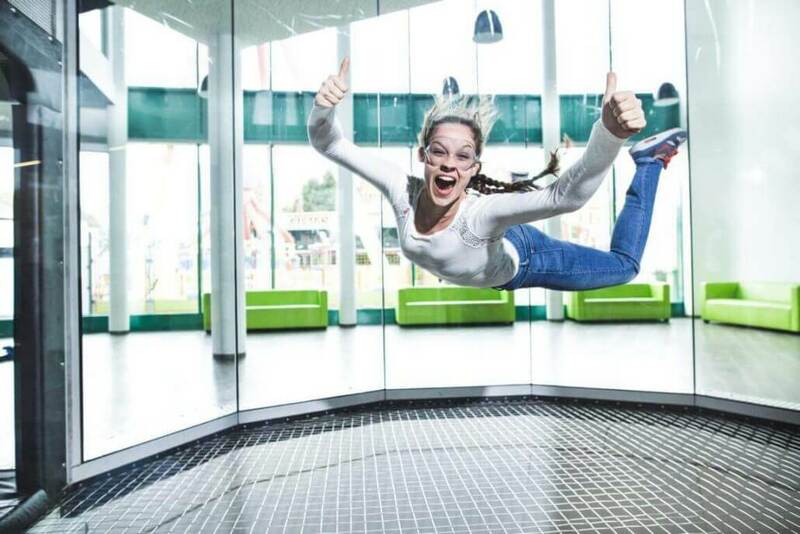 Windobona Indoor Skydiving Vienna is located close to Praterstern station. You get there by using the U1 or U2, tram 5 and various S-Trains. Hands firmly on the wheel, eyes on the traffic lights and the rumbling of engines all around – that’s what a race car driver must feel like. Anyone who wants to experience that should visit Monza, Vienna’s only indoor kart track in the 23rd District. On 4000 square meters and two levels you can drive races in 9 hp karts. The tracks are up to 500 meters long and up to 9 meters wide, so you have enough space to let your fellow racers see the back of your kart. You get all the equipment you need at the center. The price starts at 15 Euro per person for 10 minutes of racing experience. Additionally you have to pay a fee of 3 Euro once, after which you can access the center for one year. This includes a free race on your birthday. Every Sunday between 8 and 10pm there’s a 3 Euro discount. Kids pay 11 Euro per person and race. The kart track opens Tuesday to Friday between 4 and 11pm, Saturday between 12 and 11pm and Sunday between 9am and 11pm. The center is within walking distance of the 66A station Laxenburger Straße/ corner Oberlaaer Straße. First there was Flynn in the sci-fi thriller Tron, then Facebook bought the company behind the world’s first VR specs. Virtual reality is coming to life! In the Vienna area, especially at Shopping City Süd, the company VR Adventures offers a number of possibilities to become part of the virtual gaming world. It gets colourful and fruity in the game Fruit Ninja. Perhaps, you’ve played the game on your smartphone or tablet, but VR adds two new dimensions to the game. Another VR experience you should try is called Audioshield. In this game you dance to a rhythm while trying to block gigantic balls, exploding into a firework of colours after you succeded. Overall, there are seven games to be tried out that will definitely give you an adventurous time. In a group of up to eight people who can book the gaming zone for one hour and in this time train and thrill your senses. The price is 15 Euro per person. Anyone who wants to stay in Vienna can visit VRei Café in the 7th District. The virtual world opens Monday till Friday from 11.30am till 10pm and on weekends from 10am till 10pm. You get to Shopping City Süd by taking lines 207 or 265 or Badner Bahn. There are teams with a variable number of people. You get basic information and security advice. There are different modes like Capture the Flag, Team-Elimination or Dog-eat-Dog. In Vienna you can play laser tag and paintball in different locations. Concerning the price there’s a range from 15-40 Euro per person for about two hours of playing. It depends on the location, the size of your group and the kind of game. Laser tag is usually the less expensive version since no material is used in contrast to paintball. We recommend to begin planning by getting information on all the locations. They differ in course size and equipment as well as design. Some courses have a more detailed interior, some are rather pragmatic. A location that offers both laser tag and paintball is Moon Paintball at Shopping Center Nord. In groups of at least 6 people you can play every day between 8am and 11pm, if you want to go there alone you can play Wednesday between 5 and 10pm. Laser tag can be played every Friday between 4pm and 12am. You get there by taking the S3, tram lines 30 and 31, or bus 431 to Brünner Straße station. A totally different indoor activity that is much calmer than Skydiving or Paintball is Dinner in the Dark. Like the name says it means that you go on a culinary adventure in the dark. To everyone who doesn’t understand why this would be worth a try, we recommend taking a slice of bread and try to eat it slowly with your eyes closed. The human body can process sensory impressions much more intensively when it’s dark and there’s no visual distraction. This means that the sense of taste is much stronger when it’s dark. Additionally, there’s the challenge to find your way around in the dark and eat without dropping all four of your courses to the floor. Spilling, however, is officially permitted at the Dinner in the Dark and can hardly be avoided. In Vienna the challenge is offered at the restaurant Vier Sinne in Ottakring. In a group of up to six people you pay 87 Euro for your 4-course-meal, including aperitif. For larger groups the dinner is less expensive. The restaurant opens Thursday between 9 and 12am and Friday and Saturday between 4 and 7pm. You find it in the neighborhood of Ottakring station where you can go by U3, S45, as well as lines 2, 46, 45B, 46B and 146B. Prior to your first Dinner in the dark we recommend trying our very own indoor activity. Crime Runners is the Live Action Adventure at Schottentor, the next generation of the classic Escape the Room concept. You get orders by our operator, a countdown of one hour, covered up tracks on the walls and complex riddles that you need to solve in order to uncover the story hidden in the room. This is combined with special effects and various specially timed sequences that will excite you and your group. You can play in a group of two to six people or book various rooms at the same time for more players. In our three rooms we tell the story of Simon Dickson. Help our operator to find proof against the corrupt politician, solve a murder case in the cellar or find a hidden virus in the research lab. We are open on weekdays from 10am to 10pm, and on weekends from 4 to 10pm. Crime Runners is within walking distance from Schottentor station. You best get here by taking the U2 or the tram lines 1, 37, 38, 40, 41, 42, 43, 44, 71, and D.
We hope that our article helped you collect ideas for your next adrenaline rush. Our three escape rooms by Crime Runners are located in the center of Vienna close to Schottentor. The price starts at 22€ per person. Choose your favorite chapter, make plans with your friends and join our fight against corruption. Are you ready for the missions of the Operator?